Parking can be found at "The Jug Shop"on the corner of Pacific Avenue and Polk Street, which is approximately one and a half blocks from the restaurant. Seven Hills is available for private parties as well as buyouts. We will cater the menu to meet your needs. We can cater your next event, please email us with your requirements. Welcome to Seven Hills. 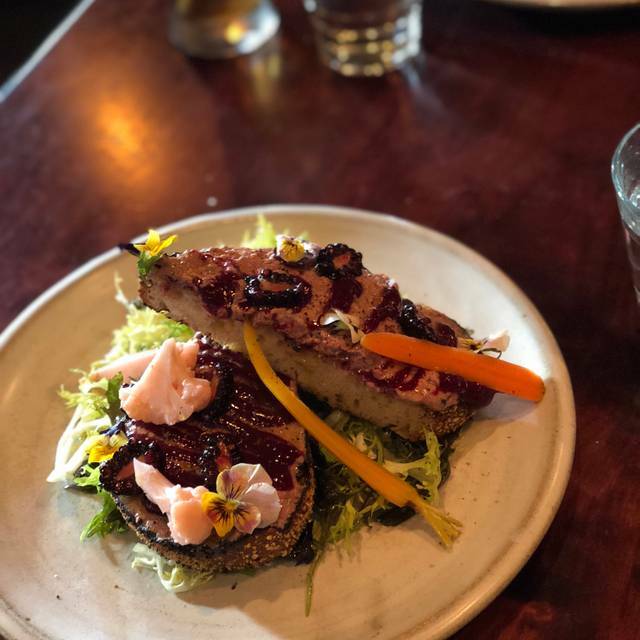 We are a rustic neighborhood bistro offering regional Italian food, located in the Russian Hill Neighborhood of San Francisco. We serve great fresh affordable food. Our emphasis is on homemade pastas. Our wine list is small but extremely well thought out and complements our cooking style. We look forward to taking care of you and your guests. If you can't find what you are looking for online please call us directly at the restaurant. See you soon! Great service great food, kid friendly and very accommodating to dietary needs. Can’t wait to go back. Innovative, fresh, delicious. A great experience, only marred slightly by other guests who were loud and inconsiderate. These seniors (in their sixties at least, probably eighties) were so loud as they came in and talked to the host that we couldn't hear our waiter talk about the specials, Leaving that aside, this is a gem of a place and we plan to return. A somewhat hidden gem, this is our go to spot for great Italian food. The food was outstanding: both tasty and original. The restaurant kindly prepared a dessert menu which mentioned our special occasion. It was a bit tight in terms of space but it's a small restaurant. The kind of place that you yearn to return to again and again. Outstanding dinner and service. Came highly recommended and definitely lived up to our expectations! Nice neighborhood, tucked away restaurant. Three of us enjoyed our appetizers and pasta entrees. My husband said his fish was undercooked. There were only three dessert choices so we shared two. They were good. 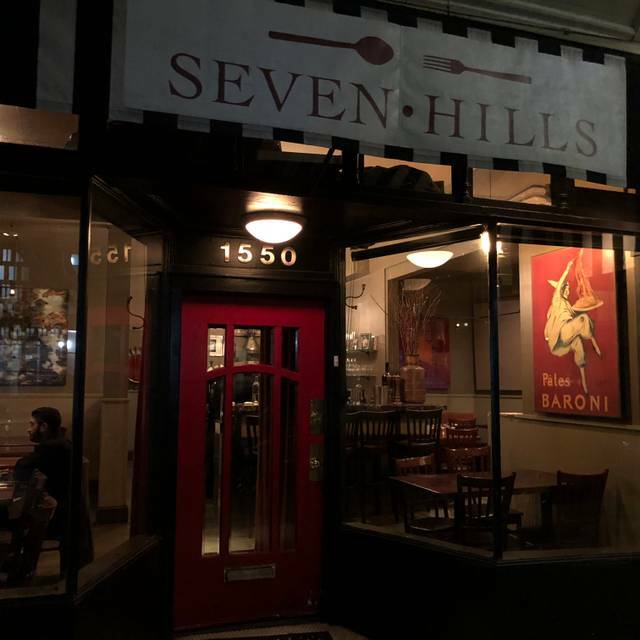 Seven Hills is a classy little restaurant that serves creative, delicious food in a relaxed but upscale space. Wait staff were attentive and helpful. They accommodated the eight year old who wanted plain pasta, while we enjoyed our fabulous pastas and wines. I highly recommend this place. It will be one of my favorite memories of San Francisco. Fantastic food, some of the best we have ever had! Close seating so your neighbor(s) will affect your experience. The service was impeccable. The food and service was great! Splurged and got an expensive bottle of wine, which wasn't as great as we were anticipating, but that may just have been the wrong choice of wine. Overall, food was amazing and the menu choices were unique, as there was a lot of different dishes to choose from, but all very appetizing. wanted to take our out of town friends to a small neighborhood Italian restaurant. could not have been happier with our choice. 2 of us had the fish special, and 2 of us had the pasta special topped with truffles (which to be honest I had never tried before). all food delicious. nice wine list with some very reasonably priced wines. service top notch. highly recommended; we'll be back again. Tiny portions for an Italian place. Truffle pasta was very good-just wish there was more. Squid ink was ok. Dessert was just ok and also small. The restaurant is so cozy and intimate and the service was great. The food was amazing. My highlight is the meatballs (the tomato sauce is the star) and the black truffle tortelloni. Every other dish we had lived up to expectation as well. Definitely coming back in the future. It was a great farm-to-table dining experience. We ordered grilled Brussels sprouts to share, lamb pasta and seafood pasta. They were cooked well and delicious. Servers were very attentive and overall service was great as well. Recommend this place! Outstanding. 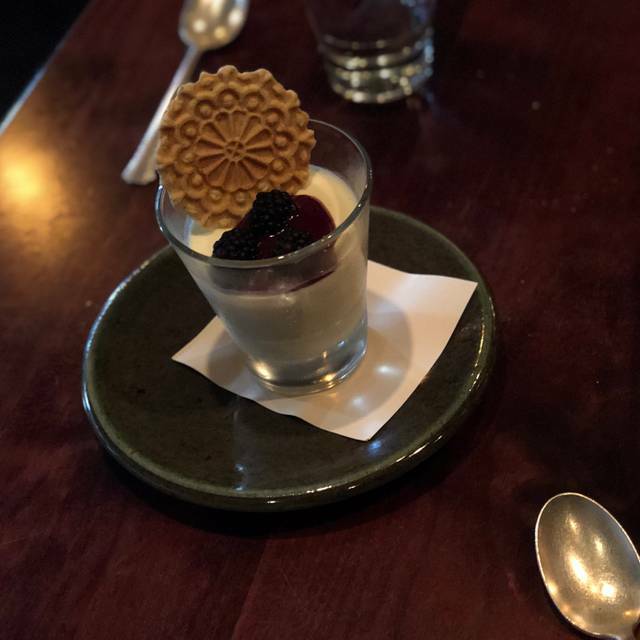 One of my customers said it was the best dining experience he has ever had in SF. My 3rd time here and I will be booking another dinner soon. Thanks Anthony!! Delicious well prepared food, friendly warm service. Look forward to the next time! I had a wonderful dinner on a Monday night and liked it so much that I returned for dinner the following Wednesday. Perfect again. An original menu with delicious food and very nice atmosphere. What a treat to have it in my neighborhood. This is a very special restaurant. Our most recent meal was overall not quite as "exquisite" as in the past. The menu changes regularly - which is wonderful - yet one dish can be truly exceptional while another falls slightly short of expectations. Seven hills was an excellent meal.. the wine pairing was great for the price . Pasta was homemade and deliciousness .. The food was exquisite and the service as well. We would recommend this established to anyone visiting San Francisco. Outstanding food, outstanding service, cozy neighborhood restaurant in a great location. It was a most enjoyable evening and we are anxious to return soon! We had a wonderful dinner experience. Louis was spot on with his wine recommendation, and very attentive throughout our dinner. We had the best lamb ever! The buffalo mozzarella was delightful. Who am I kidding it was all locally sourced and to die for! This is a another overly yelped-hyped restaurant. Yes, the food and the service are great. Any Denny's has better ambiance than this place. Maybe they are victims of their own success. Did you guys packed in the tables to get more costumers. A note: If I am going to spend $200 on dinner for two, I want tablecloths, and not having to lay down my silverware on a table of questionable cleanliness. I also want a degree of privacy, not having to listen to every word of the gripping conversation from my next-table neighbors. A restaurant at this price point should pay attention to ALL details, not just the food. Too loud! Stunning food; good service if a tad frazzled. Consistency. I've been to Seven Hills quite a few times now and it's never disappointed. Instead of going for a starter, a salad, and entrees, we opted for three entrees and we couldn't have been more happy. The Syrah was delicious and complemented the dishes wonderfully. Service was on point, as always. Seven Hills is always a special dining experience. Couldn't recommend it more highly. great service and full of charm. The whole experience from start to finish was awesome. Very cute, small, cozy restaurant with a nice ambiance for a date-night. Ordered the crab squid ink pasta special, their macheroncelli, and their fish for the day. Our favorite was the classic macheroncelli. It's amazing, the perfect amount of tangy tomato with a creamy but not heavy ricotta to cut it. Was delicious. 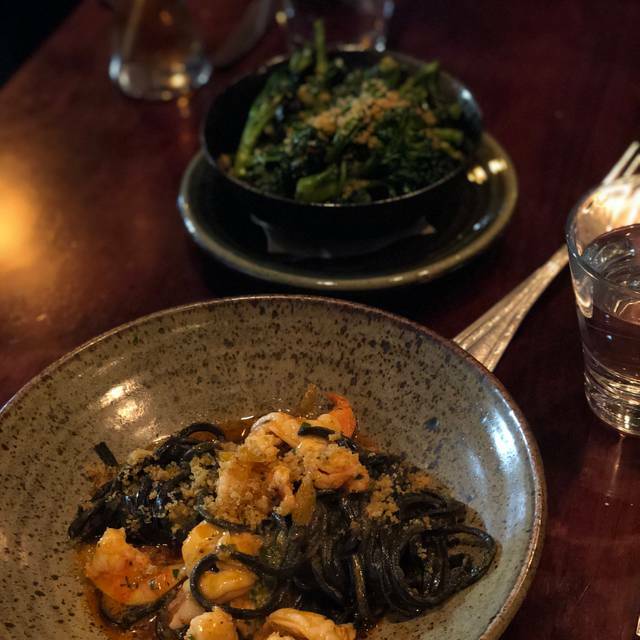 The crab squid ink pasta was also fabulous. Their food had the right flavors, very well balanced, and we walked out incredibly happy. For desserrt we ordered the date cake, which was not too sweet or too-datey and had a nice soft but yet some crispy caramelized corners. Service was also attentive and great. We will be back! Loved our meal tonight! Our waiter, Tony, was especially attentive and provided fantastic service. Our first dining experience with you and we will definitely be back the next visit to SF. The brussels sprouts were really good and one of the pasta dishes was really tasty. I would get these dishes again. Overall a little pricey but they do have some good dishes. Love this place - the fresh pasta, the consistency and the recommendations from the waitress was amazing. 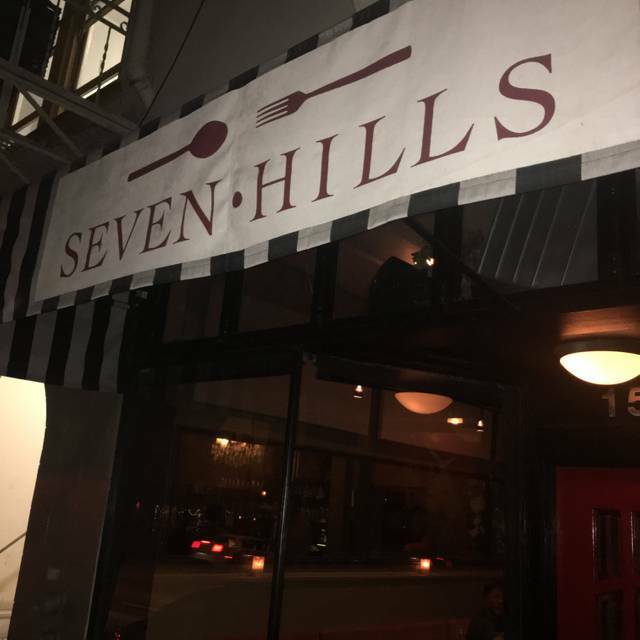 Seven Hills was phenomenal....the restaurant is a classic San Francisco style restaurant with amazing service and delicious meals. I loved it! It was a perfect scenery and just so calming and enjoyable, service was excellent and the food was amazing.